- Do not work with herbs without knowing their effects. - Affiliate links, advertisements and sponsorships are active on this site - because I need to eat! - Cookies may be active on this site. - The publisher of this website offers the information here as an informational resource only. I make no guarantees or warranties - you alone are responsible for your actions and how you use any of the information on this site. Be careful what you wish for! - Nothing on this website offered as professional, medical, or legal advice. This website is for informational, review, and entertainment purposes only. ​- I remind my readers that all items I choose to use or promote, and all services I choose to provide, are sold as curios only and in no way do I guarantee successful outcomes. - I do not claim to treat or cure any illness or condition. Nor do I offer my advice/experiences or workings as a substitute for proper legal, medical, relationship or financial advice. ​- I use and endorse the tools of magic only, not the outcome. The intent and working are up to you! Check out these awesome Santa Muerte LED altar candles available on Zazzle. The artwork is by an amazing artist, and my little sister, Sarah - www.SarahBustillo.com. More to come as I can afford to commission more artwork. NOTE: I earn a small commission off the sale of each LED candle. 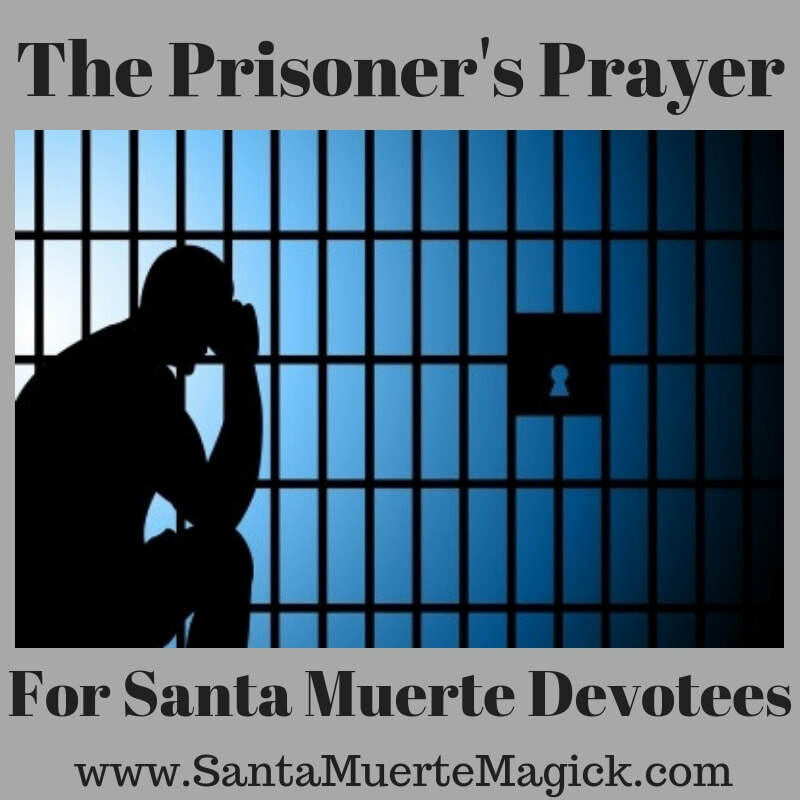 ​A simple prayer for anyone in jail, prison, or government detention. Depiction: In the Tarot de la Santa Muerte, the card "El Mundo" shows a white cloaked Santa Muerte appearing to hover against a backdrop of a dark sky with dark clouds, holding the Earth in her hands. A full, bright moon shines behind the head of Santa Muerte like a halo. 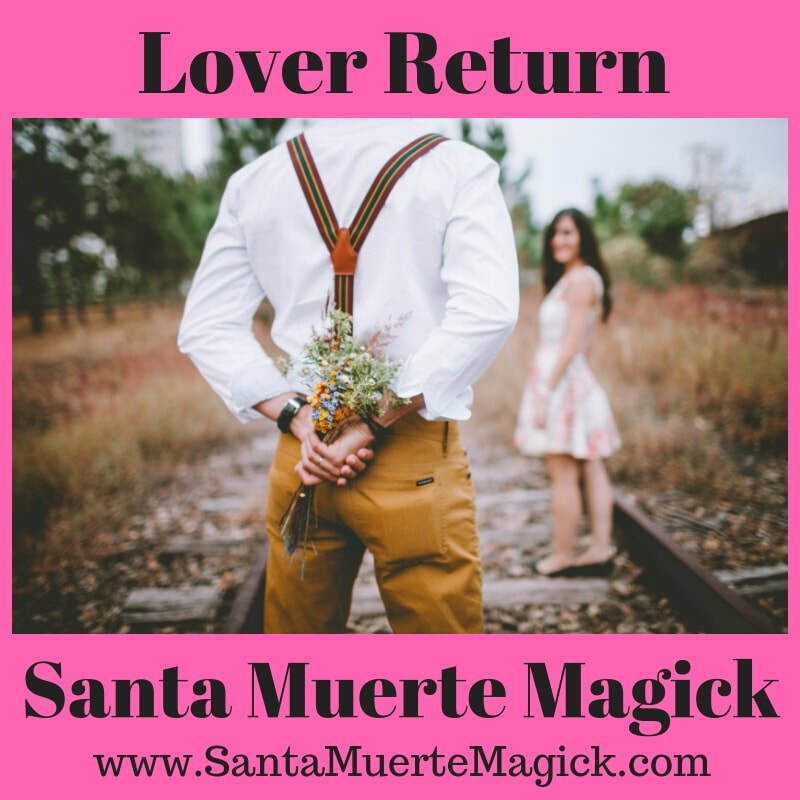 A scythe floats to one side of Santa Muerte, and an hourglass appears to float on the other. For the return of a lover lost. To cause the breakup of a romantically involved couple. ***This was written at the request of a reader. 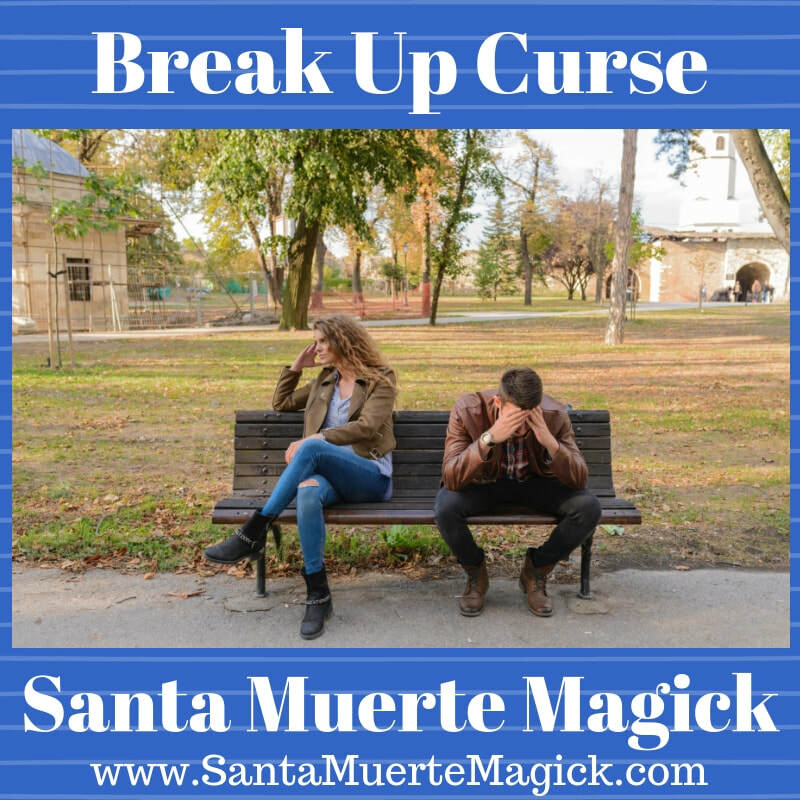 Looking for a Santa Muerte magick spell for a specific purpose but don't see it here? Get in touch to make a suggestion! 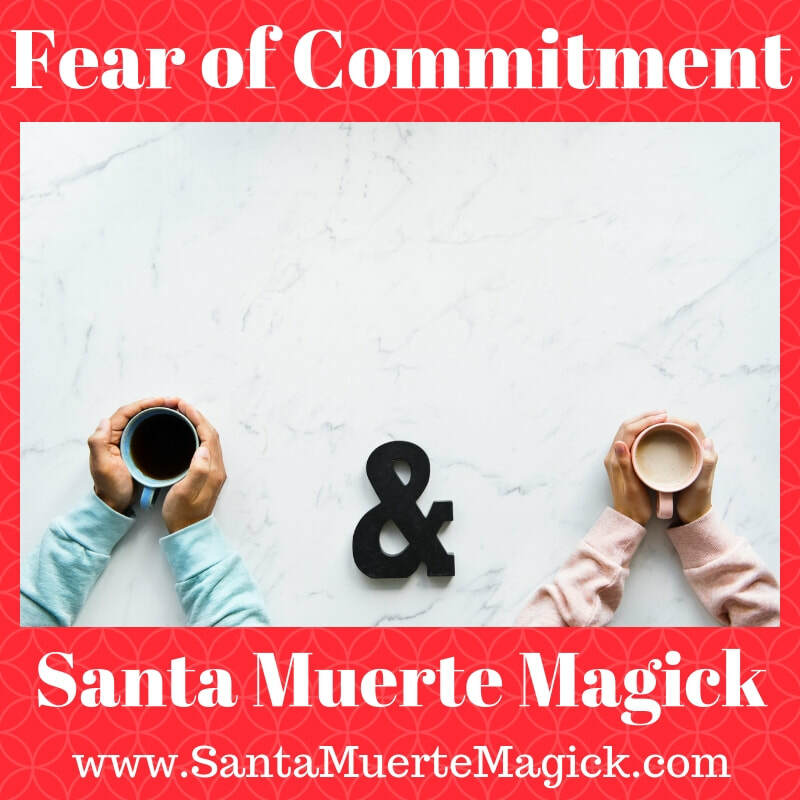 Depiction: In the Tarot de la Santa Muerte, the card "El Juicio" shows a white cloaked Santa Muerte hovering above an open casket, one hand extended to greet the skeleton stepping out of the casket, the other holding an expired hourglass. The inside of the casket appears bright purple, and the headstone that would mark the casket's location appears to be breaking / crumbling. 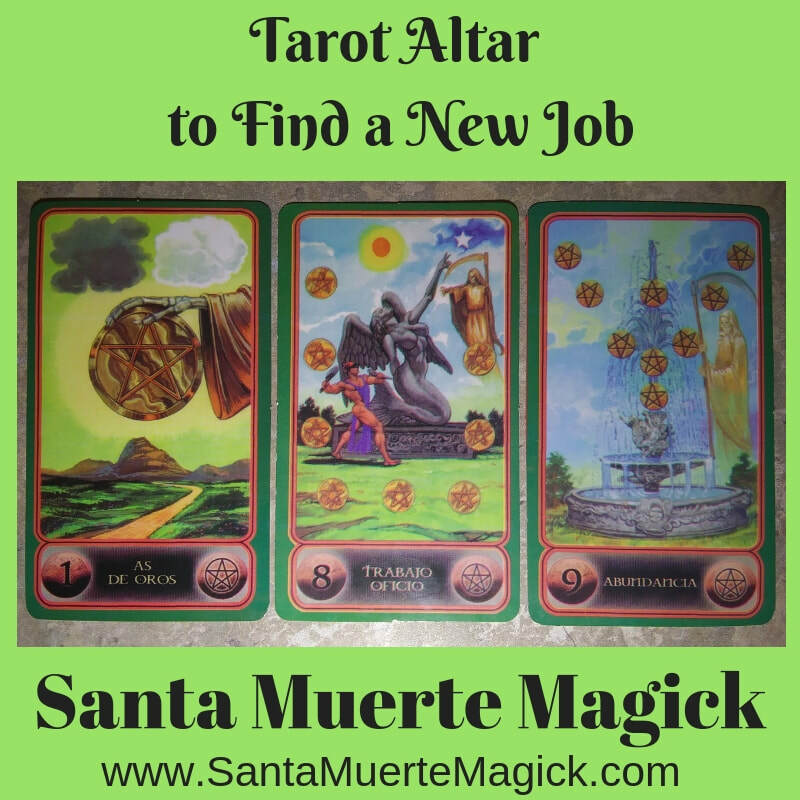 For when you need to attract new or extra work into your life. A petition to destroy commitment issues in an otherwise good relationship, to help your relationship move forward when fears of commitment are holding it back. May be performed for relationships at any level, whether you're looking to go steady or get married.